Infamous for its signature rattling sound, the Western Diamondback Rattlesnake is a legend of the American West. The Western Diamondback Rattlesnake (Crotalus atrox) is a venomous pit viper species found throughout the southwest. Its signature “rattle” sound is one of the most recognizable and distinct sounds in nature. 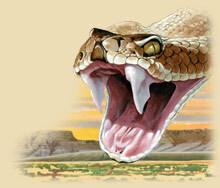 American Expedition is proud to present information, interesting facts, artwork and photos of the Rattlesnake. The Western Diamondback Rattlesnake is a venomous pit viper that commonly grows around 4 feet in length. However, these snakes can reach lengths of up to seven feet which makes it the largest of the Southwestern desert rattlesnakes. They have a triangular shaped head with two dark diagonal lines on each side of their face running from their eyes to their jaws. Their name is derived from the dark diamond-shaped patterns along their back. Their tail has black and white bands just above the rattles. This coloration is more easily visible on young snakes but is faded on older snakes. 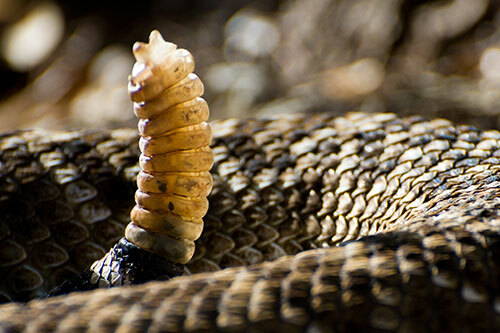 The iconic rattle at the end of the Rattlesnake’s tail is made up of a hardened protein called “keratin,” the same protein that forms human hair and fingernails. A new segment is added to the rattle each time the snake sheds its skin. However, due to varying rates of shedding and the fact that segments regularly break off, the size of the rattle does not reflect the snake’s age. 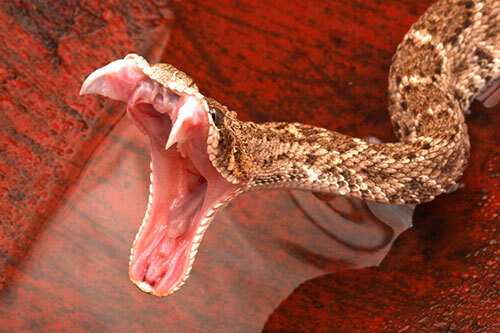 Rattlesnakes will use their rattle to warn that they feel threatened and may be about to strike. During breeding season in the spring, the male rattlesnakes will compete for the females by “wrestling” each other. The gestation period lasts for about 167 days and the mother will then give birth to a brood of about 14. 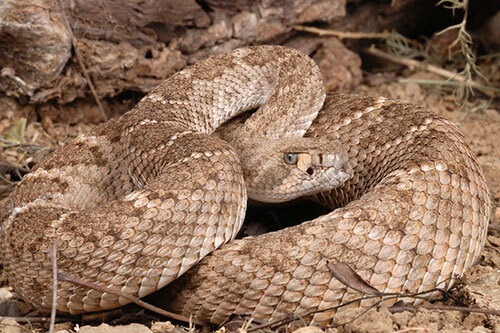 The young rattlesnakes are fully developed when born, and thus already have a venomous bite. After only about 2 hours, the mother will leave the young. They will then have to fend for themselves in search of food and shelter for the coming winter. Rattlesnakes give birth live, and can have up to 25 babies (called 'neonates') in a brood. Full grown rattlesnakes can range from 3 to 7 feet in length. The average rattlesnake can live 15 to 20 years. A rattlesnake can move the rattle on its tail back and forth 20-100 times in just one second. 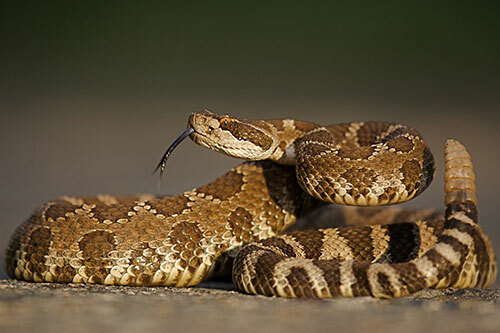 Rattlesnakes are ovoviviparous, which means that they produce eggs but the eggs hatch in the mothers body, and therefore result in live birth of the young. The rattlesnake’s signature “rattle” is formed from the hardened remnants of the snake’s shed skin. The rattle grows segment by segment, adding a section with every year’s molt. The rattlesnake can survive 2 years without eating. Rattlesnakes give birth around the beginning of the fall season. Predators of rattlesnakes include roadrunners, large birds, coyotes, and kingsnakes. Other animals who see these snakes as a threat and may try to trample them include cows, horses, antelope, and deer. The Diamondback’s range includes the entire southwestern U.S. and northern half of Mexico. They enjoy territories such as deserts, plains, rocky regions, and forests. 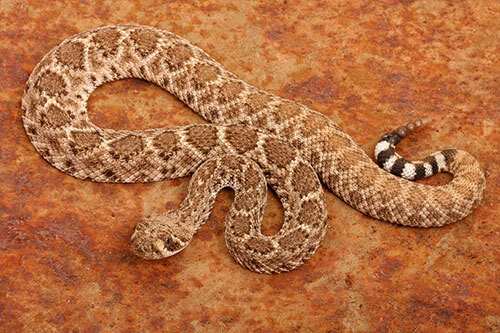 Rattlesnakes prefer to hunt at night, feeding mainly on rodents and small mammals. The snake’s favorites include mice, rabbits, and lizards. The snake bites its prey to inject venom. At times, the snake’s teeth will stay in the animal. However, a snake is capable of replacing its teeth if it loses them. After the victim is dead, the snake will swallow it whole. It will digest as it passes through the body. The rattlesnake is very persevering, capable of surviving up to two years without eating! Know how to identify different types of snakes. The features of a rattlesnake are very distinguishable. Try to avoid entering the habitat of a rattlesnake. Rattlesnakes are most active on warm days. Rattlesnakes like to hide in the rocks and shrubs. Rarely, unless they are moving, will you see them in open areas. They like to avoid contact with predators as much as possible. If hiking in rattlesnake country, dress properly. Bites are common on the ankles and feet. For that reason, wear thick boots. Always carry a phone with you in rattlesnake country, and hike with a friend, never go alone! Keep a sharp eye out for rattlesnakes, and watch every step. If you spot a rattlesnake, back away quietly and leave the snake alone. Rattlesnakes do not always “rattle” before they attack. They may have their head raised or are in a coiled position. If you do get bitten by a rattlesnake, follow these steps: 1) Remain calm. This will decrease the spread of the venom. 2) Call 911 or get to the hospital as soon as possible. 3) Do not elevate the spot that was bitten. 4) Clean the wound with soap and water and wrap it with a bandage. A rattlesnake may shake its tail up between 20 and 100 times per second when threatened. It shakes its tail by lengthening and shortening its muscles, and will be able to make more movements per second on a warm day. 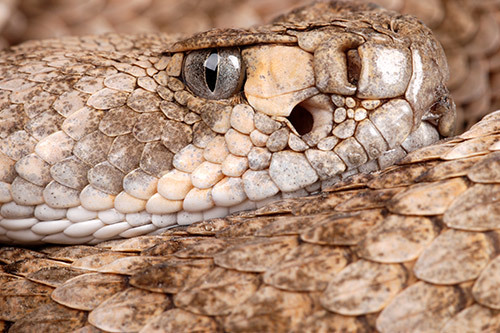 The toxic venom of the western diamondback rattlesnake can quickly destroy tissues of the body's blood vessels, blood cells, and heart, as well as many other tissues. Bites should be treated immediately. 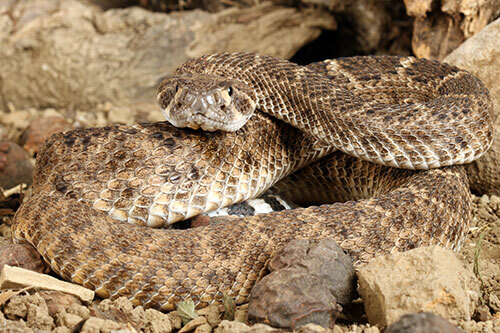 The mortality rate of untreated rattlesnake bites is between 10% and 20%. Rattlesnakes prefer living in closed, rocky spaces to open habitats. Interested in Rattlesnake Gifts & Decor? Visit the Rattlesnake section of our wildlife store!